Add Warriors veteran forward Andre Iguodala to his team's list of injured for this afternoon's ABC game against the Wolves at Target Center. Coach Steve Kerr called Iguodala a "game-time decision" when he chatted with reporters 90 minutes before the 2:30 p.m., but Iguodala won't play. 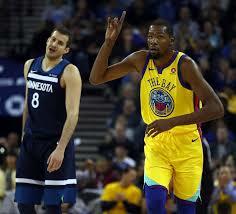 Neither, of course, will superstar Stephen Curry as well as veteran David West (arm cyst), Jordan Bell (ankle sprain) and Patrick McCaw (wrist). Don't feel sorry for the Warriors, though: They still have All Stars Kevin Durant, Draymond Green and Klay Thompson ready to go. "They've been through so many different things," Wolves coach Tom Thibodeau said. "They've played without him (Curry) before. The way Durant and Green and Thompson play, any one of those guys can step up." Guard Quinn Cook has had a right hand contusion, but is expected to play.